This Elysee Portiere Left tapestry shows a beautiful design based on the original tapestries created by the Beauvais manufacture. It is a companion piece to Elysee Portiere Right. The Beauvais manufacture under the direction of Jean-Baptiste Colbert, minister for Louis XIV, produced some of the most beautiful works in this era of tapestry production, including the works of the Gobelins production house. Here we see an urn on a pedestal with a tall arrangement of flowers. The columns, pedestal itself, and even the wall above the architecture is decorated with beautiful designs and foliage motifs. 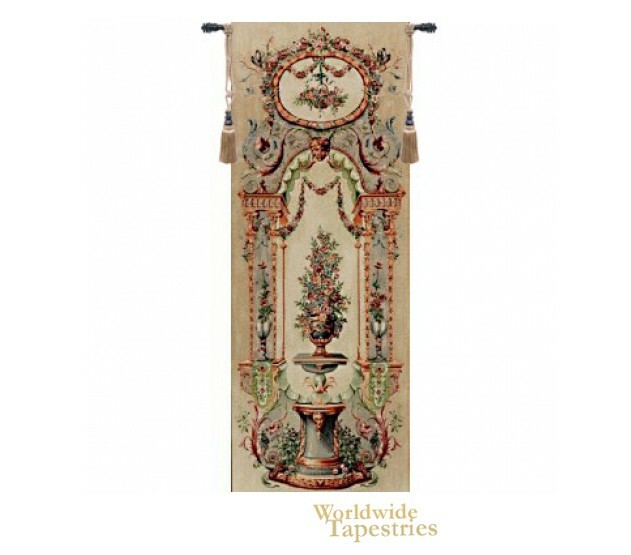 This Elysee Portiere Left tapestry is backed with lining and tunnel for easy hanging. Note: tapestry rod and tassels, where pictured, are purchased separately.